It’s important that you know how to use a fire extinguisher in the case of an emergency. Fire extinguishers are great for small fires that can be easily put out. If you know how to properly operate a fire extinguisher, it can save lives and money. In this blog, we will cover when to use a fire extinguisher, how to properly operate the extinguisher, and why you should keep up on your maintenance services. If you’re not sure when it’s appropriate to use a fire extinguisher, the list below will help you determine if you should take action or flee. Did you alert someone else that there’s a fire? Are you able to access and use the fire extinguisher? Is the fire contained and small enough to put out? Can you easily get out of the building? If you can answer yes to all of these questions, then you should use a fire extinguisher. If you aren’t sure whether it’s safe or not to use the extinguisher, then you should call 911 and get out of the building asap. Also make sure to alert other building occupants that there’s a fire to ensure everyone gets out safely before the fire spreads. The best way to remember how to use a fire extinguisher is to use the word PASS. Pull the pin and point the nozzle away from you. Aim low to hit the bottom of the fire. Sweep the nozzle from side to side to hit the entire fire. It’s critical to keep your fire extinguisher in an easy to reach place that’s clear of any dust and debris. Also you need to keep an eye on the extinguisher to make sure it’s not expired or damaged. 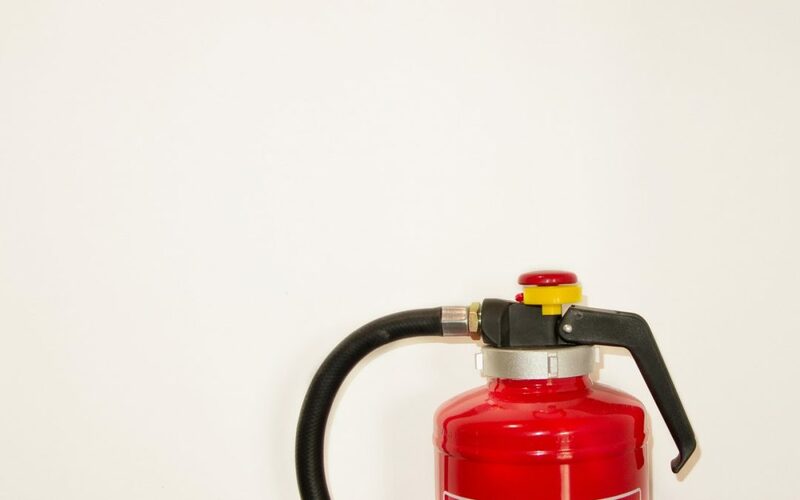 If your fire extinguisher needs replaced, there are a few sure signs to look for, which are explained in our blog, When It’s Time for a Fire Extinguisher Replacement. You can also call in a fire protection professional if you’re in need of further maintenance services for your extinguisher. A certified fire protection company can help you ensure you use the highest quality equipment, which is both safe and reliable. Frontier Fire provides fire protection services in Salt Lake City, Utah, as well as throughout Colorado. If you need to know how to use a fire extinguisher, or you’re in need of fire alarm, fire sprinkler, or fire extinguisher services, then we’ve got you covered. We offer installations, repairs, and maintenance for all devices to ensure your building is fully protected and up to code.